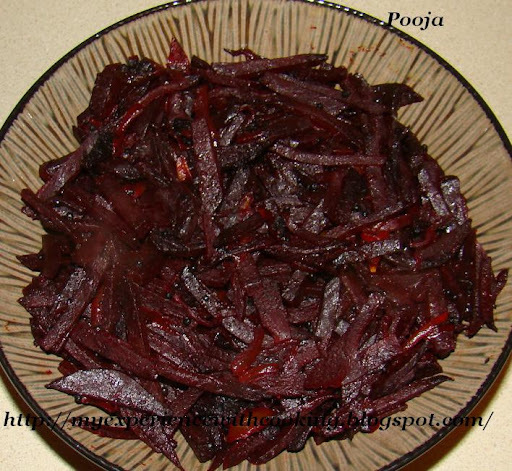 In my previous post I mentioned about vegetarian side dishes that we have for lunch.Beetroot Mezhukkupuratti/Beetroot Stir Fry is one among them.We make two types of vegetarian side dishes-one with grated coconut , called 'thoran' and the other one without coconut called 'Mezhukkupuratti' or Stir Fry. The skin of beetroot is removed first and then it is cut into thin strips and later stir fried with onions. Beets are rich in vitamins and has high iron content. It is also a good source of dietary fiber and has blood cleansing power. Due to the nutritional value of beets my mom used to prepare this often at home. Remove beetroot skin and cut into 1" long thin strips. Keep aside. In a pan heat 1 tbsp oil at medium heat and splutter mustard seeds. Add curry leaves and red chilly. Saute for few seconds. Add chopped onion and saute till it turns brown. Add beetroot strips and mix well. Add turmeric powder, pepper powder and salt. Stir to mix well and cook for about 2 minutes. Reduce heat to low and cook with a closed lid until beetroot pieces are cooked well and turns soft.